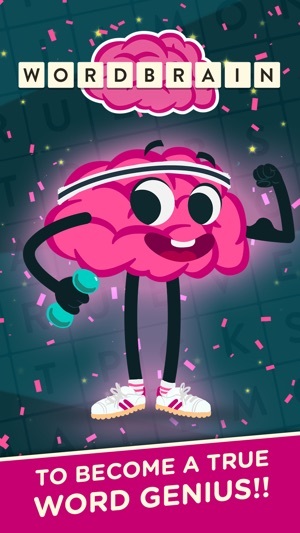 I have been playing wordbrain since November of 2017. It’s extremely addicting once you get to the harder levels. And when I say hard, I mean, hard. 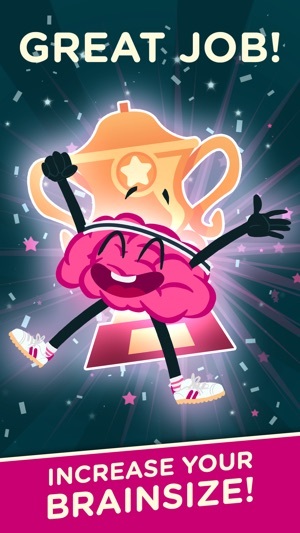 These levels have you racking your brain. So you may think, “oh. I guess I should use a hint.” Well, you don’t have many. Hints are expensive, and I’m not spending $5 on 15 hints. What I DO like is that every time you change brains, you get hints. Basically in this game you start off in a snail brain, and theres a number of levels in there. 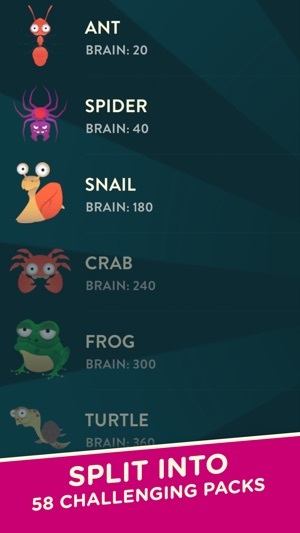 As you progress you get a mermaid brain, unicorn, and even alien. These all have levels in them. But once you progress from snail to frog, you get 7 or so hints. This makes the game easier and makes me want to level up more, knowing my hard work will pay off when I get to harder levels. Ads are a big thing in this game. I don’t like finishing a level and getting 2 ads. And they aren’t those 4 second ads, either. You get those rarely. The most common ads are the 25-30 second ones. And they are 1 or 2 after each level. And if you have been trying the level for a while, halfway though an ad pops up! 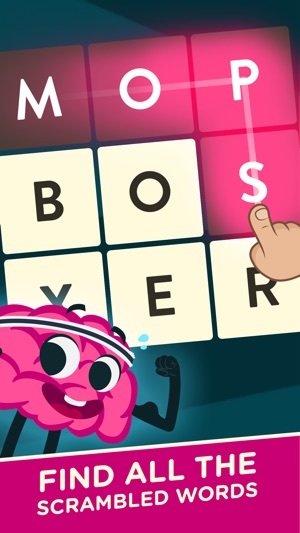 But that’s my opinion on wordbrain. I hope a developer will respond because I’d love to discuss an issues I’ve been having where I watch a video for a hint and I do not receive it. Please fix this!!! Hello Ølivia! Thak you for your time writing a review. We apologize that you always experience advertising videos. 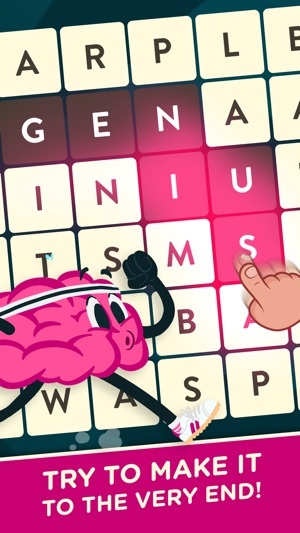 WordBrain is a free game and it needs ads in maintaining its development. For you to avoid this, you can remove ads from your game by purchasing a "Remove Ads" pack in the game.Regarding the Ad video that gives free hint, please contact our support in-game for fusther assistance. Have a wonderful day! I recently started playing this game upon a recommendation from a friend. For some reason, the game wouldn't come up in the App Store. My friend deleted her app to try to find it again and she couldn't. Happily we finally were able to locate it. So it would behoove someone to make it easier to find the app. 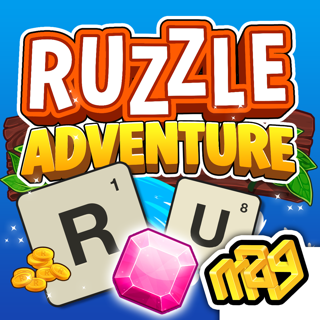 The other suggestion/complaint I have is that the game explanation/rules should be clearer on being able to go back and "undo" the game when a word is solved but the resulting letters are arranged in such a way that making the remaining word is impossible; e.g. One or two of the remaining letters is disconnected from the rest and, therefore, impossible to form a word. I used a few hints before I finally realized what was happening. Other than that, I'm very happy with this game. It's a nice break from the frustration of 4-suit Spider Solitaire. If this game could move with new hardware, it would be perfect. I am up to a very high level in this game but got a new iPad and the game won’t transfer over. As a result, I have to begin all over again. Not fun. So now I have to keep the old iPad for the sole purpose of playing the game and not losing my position. There should be a better way. The Apple people don’t support this app. I have been a long time player of this game (over 2 years). It has helped pass the time on my relatively short train commute. However, the recent changes that give you a 30 second ad (i.e Angry Birds), that takes over the screen and audio after virtually every game action has rendered the game unplayable. I would play this game while listening to a podcast. After each 30 second video ad i would have to navigate over to the podcast to relaunch, then back to the game to solve a word, then have to sit through another 30 video ad for Angry Birds, then back to the podcast player to resume playback, then back to the game, and over and over again in a non-stop loop of back and forth between the game and podcast player. I get it that the game makers want you to pay them to make the ads go away but just keep this in mind when you decide to get started with this game. You may play for a while without the constant ad interruptions, but eventually you will be faced with only 2 options, either: a) pay them to make the ads go away temporarily, or b) quit the game entirely because the way it is now, with the constant ad interruptions, it is not an enjoyable way to pass the time.